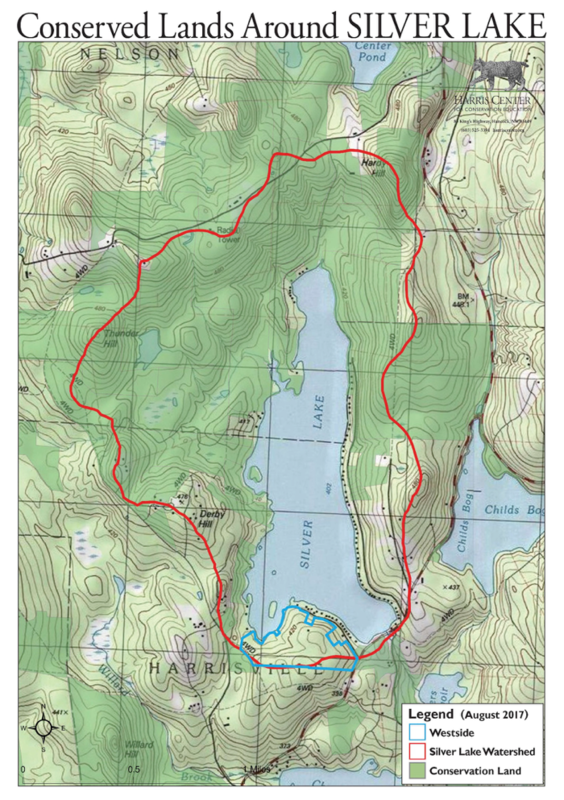 On June 4, 2010, The Harris Center for Conservation Education announced that they would soon purchase a conservation easement on 33 acres of property at Silver Lake in Harrisville that includes Silver Lake Farm on Seaver Road, a small parcel across Breed Road adjacent to the boat launch at Stoney Beach and the parcel across Seaver Road with frontage on Seaver Reservoir. June 4, 2010 – The Harris Center for Conservation Education announced today that it will soon be able to purchase a conservation easement on the historic Seaver Farm in Harrisville. The 33-acre farm is located between Breed Road and Seaver Road near the Silver Lake boat launch area and has substantial water frontage on Silver Lake and Seaver Reservoir. The farm was originally owned by Nathaniel Breed Jr., who settled there in 1767 and lived in a house built in 1774 by Paul Whitcomb. By the mid-nineteenth century, the farm and the house were part of a 460-acre farm owned by Wellington Seaver. It eventually passed to one of his nine children, Edgar G. Seaver, who continued to live there until his death in the late 1970s. Seaver left the house and most of his land to Paul Geddes, who has retained the land intact since receiving it about three decades ago. Geddes has now offered to allow the Harris Center to purchase the development rights on the land through a conservation easement at substantially below the market price. The Harris Center expects to complete the purchase of the easement soon. The land has very high conservation values, in part because it is an important element of the scenery around Silver Lake, but also to preserve water quality in the lake and reservoir and to retain prime agricultural soils.